Unfortunately this event has now passed. Please fill out the form below to be one of the first to hear about the 2018 event! 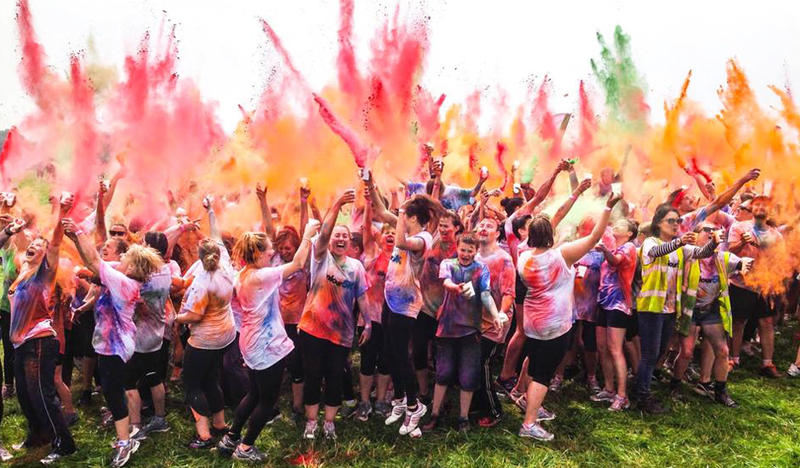 Join our Colour5k team and get sponsored to get colourful and help us support more families with a seriously ill child. Please note Rainbow Trust do not receive the registration fee for this event. To support Rainbow Trust please tick the box when signing up to receive a sponsorship welcome pack, we will then contact you and help you get started! You can run, walk or stroll the 5km at your own pace - the aim is to have fun and finish up looking like a rainbow! ‘Colour Bandits’ lie in wait at each 1km checkpoint to shower you with coloured powder paints, and you get to join in the paint throwing action yourself in a huge colour extravaganza at the finish. The day is fun for all ages and under 16’s can sign up to take part in the 1km Junior’s race. Sign up to the event and set yourself up a Virgin Money Giving fundraising page with a target of £88. £88 would enable Rainbow Trust to purchase a sensory mirror ball for a child in our care. These are a valuable resource for stimulating awareness, relaxation and learning in children with sensory deprivation. These really make a difference to those who are unable to attend sensory rooms or do not have the space or funds to have a room set up in their own home. For more information, please complete your details below or contact our Sports Team on 01372 220031. Register your place with us and we’ll send you a fundraising pack. By providing us with your details you agree to be contacted by Rainbow Trust about this event.